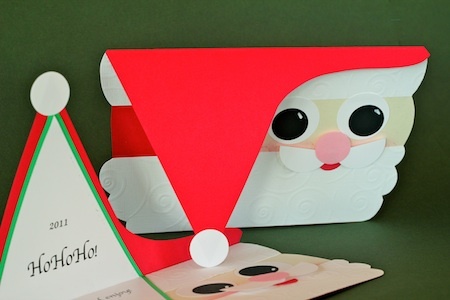 I have shared with you all of the Christmas Card designs I made over the past three decades. Today, all my friends and family should have their 2011 Marji Roy card in hand. I can now share it here online as well. This year I chose to depart from my classic tree theme and instead embrace Santa Claus. I took a geometrically inspired Santa face and hid our holiday message under his flip up hat. For years I had been wanting to use a flip up Santa hat but my designs always fell short of expectations. 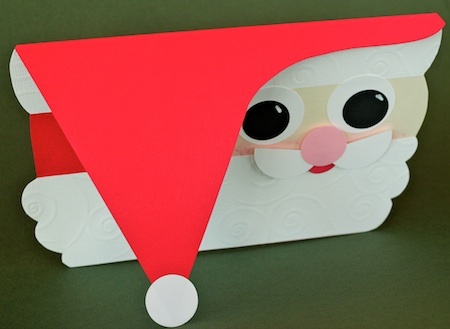 My design this year was directly inspired by a card I saw on Etsy that created a geometric Santa face with the signature triangle hat. I loved the graphic elements of this design by Tim Creations on Etsy. I started from that point and modified it in a variety of ways. First I switched the design to be a flip up hat with the fold along the top. I then extended the hat to the right to soften the image, made the nose and mustache three-dimensional with a foam sticker, added cut curves to the beard and real rouge to the checks. The end result is a jolly fellow full of personality and holiday wishes. The plan is to publish a step-by-step tutorial next November. It makes sense to stagger designs by a year. 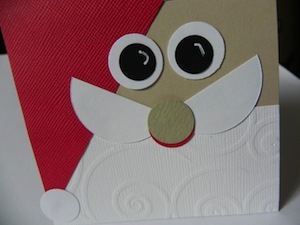 Then the recipients of my cards still have the surprise of seeing what I created this year. I send the same message to all my readers that is inside the card.